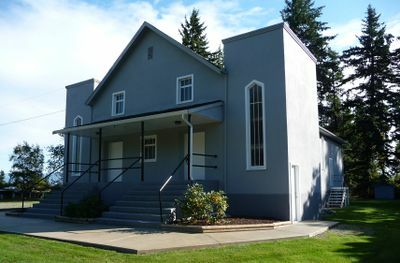 Difference between revisions of "Peardonville Mennonite Church (Abbotsford, British Columbia, Canada)"
The Peardonville Mennonite Church in Abbotsford, British Columbia began services in 1951. Initially the church (called Peardonville Mennonite Mission) was established as a Sunday School outreach of West Abbotsford Mennonite Church under Tina Loewen to accommodate those families settling along the U.S. border in the South Aberdeen area. This work eventually developed into a preaching station, with services held in the Peardonville Hall. In February 1952 a group of 15 members unhappy with H. M. Epp’s leadership at West Abbotsford left to start a new work at Peardonville. The church organized on 17 March 1952 with 28 members under the leadership of Johann Goerz and assisted by Jacob Berg. A building program was begun in 1952 with the construction of a basement 30 ft. by 60 ft., completed in 6 months. The Conference of Mennonites in British Columbia took over the work with Albert Nickel as leader, serving 26 August 1956 until 1 January 1958. During this time, the upper floor of the sanctuary was complete in the fall of 1957. After Nickel's departure, John Julius Klassen took over, providing leadership until 30 September 1963. Under Klassen's leadership the congregation formally organized themselves as a congregation on 22 November 1959 with 52 charter members, and grew to 57 members in 1961, the year they joined the Conference of Mennonites in British Columbia. Isaac Ens served January to September 1964, and David Letkeman from July 1965 to September 1967. In 1964 there were 48 members with 98 in the Sunday School program. After 1967, a variety of ministers took turns serving the congregation. Eventually, disagreements led to a split and a decline in membership. Peardonville church dissolved in 1968 at which time the membership stood at 28. In 1969 the Evangelical Mennonite Church (EMC) purchased the building for $1,000, and the BC conference transferred the proceeds of the sale to the General Conference Mission Board in Newton, Kansas, who had given the congregation a grant of the same amount years earlier. The EMC eventually discontinued their work and the building was used by a variety of groups until it was sold in 1983. Canadian Mennonite (27 September 1957): 1; (24 November 1961): 22. Lehn, Cornelia. Frontier Challenge: A Story of the Conference of Mennonites in British Columbia. Clearbrook, BC: Conference of Mennonites in British Columbia, 1990: 104, 120-122. Loewen, David F. Living Stones: a History of the West Abbotsford Mennonite Church 1936-1986. Abbotsford, BC: West Abbotsford Mennonite Church, 1987. Mennonite Heritage Centre Archives: Volume 120. Thiessen, Richard D. "Peardonville Mennonite Church (Abbotsford, British Columbia, Canada)." Global Anabaptist Mennonite Encyclopedia Online. November 2011. Web. 23 Apr 2019. http://gameo.org/index.php?title=Peardonville_Mennonite_Church_(Abbotsford,_British_Columbia,_Canada)&oldid=112495. Thiessen, Richard D. (November 2011). Peardonville Mennonite Church (Abbotsford, British Columbia, Canada). Global Anabaptist Mennonite Encyclopedia Online. Retrieved 23 April 2019, from http://gameo.org/index.php?title=Peardonville_Mennonite_Church_(Abbotsford,_British_Columbia,_Canada)&oldid=112495.